Native Clevelander Russ Schneider has reveled in the successes and lamented the failures of the Cleveland Indians from his earliest childhood. After graduating from high school in 1946 and serving two tours of duty with the U.S. Marines, Schneider acquired a degree in English from Baldwin Wallace University. Following a brief (but uneventful) season as a minor league player, Schneider became a sportswriter and columnist at the Cleveland Plain Dealer. He covered the Indians daily from 1964 through 1977 and became nationally known as the chronicler of the Indians’ fortunes and history. That experience provided Schneider with the opportunity to meet and befriend the icons of the Tribe—among them, Bob Feller, Lou Boudreau, Larry Doby, Early Wynn, Bob Lemon, and others. This beautiful coffee-table book features forty twentieth-century Indians legends, beginning with the era when they were the Cleveland Blues. Schneider has divided the Indians’ history into quartercentury periods, selecting ten players from each as stars of this historic franchise. Illustrator Tom Denny, known for his dynamic and creative images in oil, watercolor, and mixed media, has created portraits and action scenes for each of the forty iconic players. Napoleon Lajoie, Tris Speaker, and Jim Bagby Sr. from 1901–1925; Mel Harder, Bob Feller, and Lou Boudreau from 1926–1950; Larry Doby, Rocky Colavito, and Bob Lemon from 1951–1975; and Omar Vizquel, Jim Thome, and Kenny Lofton from 1976–2000 are some of the forty outstanding players selected. 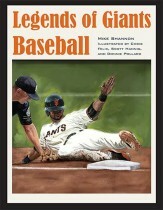 Also included are highlights of each player’s career, biographical information, and career statistics. 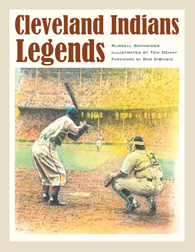 Sure to be treasured by sports enthusiasts and baseball lovers everywhere—especially Indians fans—Cleveland Indians Legends is a handsome and informative addition to the history of baseball. AuthorsRussell J. Schneider is an award-winning sportswriter who wrote for the Cleveland Plain Dealer until his retirement in 1993. He was elected to the Cleveland Journalism Hall of Fame and has been nominated for election to the Baseball Writers Wing of the National Baseball Hall of Fame in Cooperstown. He has written Whatever Happened to “Super Joe”? : Catching Up with 45 Good Old Guys from the Bad Old Days of the Cleveland Indians, The Boys of Summer of 1948: The Golden Anniversary of the World Champion Cleveland Indians, and The Cleveland Indians Encyclopedia. Tom Denny has been an illustrator, designer, and art director for more than forty-five years. He hastaught fine and commercial art at Cuyahoga Community College. A native Clevelander, Denny is a longtime fan of the Indians. 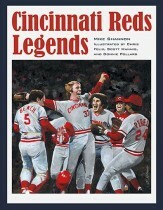 Reviews“Cleveland Indians Legends” (Black Squirrel/Kent State, $29.95), sounds like an unlikely volume, but — wonder of wonders, miracle of miracles — it contains no snickers about the great failure of Cleveland teams to win any championships since 1964, when the Browns came out on top of the National Football League. The Indians lack pennant titles and book titles, at least compared to their colleagues in New York, Boston, Chicagoand St. Louis. But Russell Schneider, a Cleveland legend himself for his years as a sportswriter, has assembled his own hall of fame in a coffee-table book. Here’s Tris Speaker, Bob Feller, Lou Boudreau, Bob Lemon, Early Wynn, Larry Doby, Sam McDowell, Luis Tiant, Jim “Mudcat” Grant — and Omar Vizquel and Kenny Lofton. Schneider includes both Albert Belle and Buddy Bell, somehow resisting the urge to include Gary Bell, an Indian between 1958 and 1967, with 96 wins to his credit. No, Gaylord Perry (who won 70 games and a Cy Young Award while on the Indians) isn’t here. He’s in the Hall of Fame but was not an MOT (member of the tribe) long enough to be included. You don’t have to be a Clevelander to feel the pain of the Indians, who haven’t won a World Series since 1948, or to recognize that the lack of championships doesn’t mean there was any lack of legends. Hooray for the Indians, and for this book.